Joining us today on the Annie’s Book Stop of Worcester blog is Terri-Lynne deFino, author of Finder, A Time Never Lived, and Beyond the Gate–and one of our Women of Myth and Legend who’ll be holding a panel on Sunday, March 23 from 2-4PM. Thank you so much for joining us, Terri! Can you please tell us briefly a little about yourself and your writing? How would you like us to introduce you? I am Terri-Lynne DeFino, writer, mother, cat-wrangler, editor, and sparkle queen. I come by my titles honestly, and hold them in great honor. My first novel, Finder, was published by Hadley Rille Books in 2010. Since that time, I have published two more books (A Time Never Lived and Beyond the Gate) with HRB, and—as is the way with many small presses—took on other roles. I’ve edited nine books, and had my hand in several others. I am currently acting editor-in-chief at Hadley Rille Books, due to a medical emergency. Wearing so many hats gets a little exhausting, but life is never boring. I write primarily fantasy fiction with a romantic bend. My stories are about the people within the big events, not the events themselves. At the moment, I am working on two novels simultaneously, The Shadows One Walks—another fantasy to be published by HRB in 2016—and Seeking Carolina, a contemporary fiction—something I’ve never tried before. For readers unfamiliar with your work, how would you describe what you write? What can readers expect from [newest release/spotlighted release]? My work is largely about the people living within a greater world wherein BIG THINGS are happening. Finder is set against a backdrop of slavery and an illegal spice trade. In A Time Never Lived, a young man’s search for his father takes place in a world moving from Age for Age. 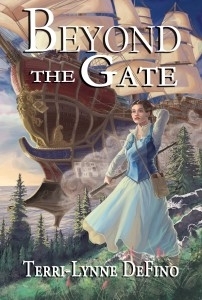 Linhare and Wait’s adventure in Beyond the Gate exists in a world Beyond their own, one in which the turmoil of their own nation is oblivious. My stories always have romance in them. There is no such thing as a life lived without love—or the lack of it; I want to tell my character’s stories as authentically as possible. The romance doesn’t necessarily end happily-ever-after. Some do. Others can’t. All have to work for what they do get. That’s the way life goes. What was the biggest challenge in writing and putting out Beyond the Gate? How did you overcome that challenge? The biggest challenge to Beyond the Gate (BTG) was word count. Backtracking a little, I wrote BTG before Finder was even a twinkle in my eye. It started its life at 199,000 words! I knew it was too long. I trimmed it down to 179K. Still too long, but I didn’t know how to get it any down further without sacrificing the story. I shopped it around a little, but the same answer kept coming back. Too long to consider. By this time, I’d already started Finder. I decided it was time to put BTG away and try again with something new, something simpler. I didn’t think BTG would ever come out of “the trunk,” so I cannibalized it. I used a bunch of cool details from BTG in Finder and gave it a much simpler plot in comparison. I finished Finder in nine months, sold it to the first place I queried (I’d had my eye on Hadley Rille Books as my first choice for quite a long time) and it was published nine months after that. Huzzah! By then, I’d already started and had been offered a contract for A Time Never Lived (ATNL.) In the editing process of ATNL, I realized that BTG was, in fact, the third book in the cycle. By now, I had the skills and understanding to pare that wordcount down to a svelte 141K, because, though Eric Reynolds (publisher and editor-in-chief at HRB) would have published anything I gave him, I knew the story didn’t need that many words. I am thrilled with how it turned out. My favorite part of being a writer is that I am a writer! When I was a kid stapling bits of paper together, it’s what I wanted. When I was a teenager dreaming big dreams, it’s what I wanted. As a young mother with a gazillion stories in my head and no time in which to get them out, it’s what I wanted. I began writing hard when my youngest started pre-school. I taught myself everything I know about writing through trial and error (aka, writing 21 novels that shall never see the light of day, and doing a lot of peer editing!) Aside from a stray story here and there, I didn’t publish until I was forty-six years old, but now I have three published novels, and every reason to believe there will be more to come. It’s pretty damn cool. My favorite part of the writing/publishing process is actually those I’ve met along the way. I love to write. I love to edit. But those people I have met through this whole process, from other writers to editors to booksellers and artists, are a great treasure I honor deeply. And with my books now being produced as audio-books, that world is spreading yet again to the actors narrating them. It is extraordinary and humbling and nothing I ever expected, but am truly thankful for. My greatest lesson along this journey has been—Never stop learning! When you stop learning, your mind closes up. When your mind closes up, the stories can’t get out properly. No matter how much you think you know, there is a universe of things you don’t. My books are available on Amazon, Barnes and Noble, and anywhere else books are sold. You may have to ask nicely to have it ordered, but HRB works with all the major distributors. Thank you, again, for joining us, Terri!! We are so happy to have you back at ABSW this Sunday from 2-4 PM. Come join us for a wonderful afternoon of Women in Myth and Folklore—a panel with Terri-Lynne DeFino, Francesca Forrest, and T.J. Wooldridge. This entry was posted in author spotlight, events, interviews, Local Authors, Spotlight and tagged Author Spotlight, events, fantasy, Folklore, legend, myth, Spotlight, Terri-Lynne, Women's History. Bookmark the permalink. Thanks for having me! Can’t wait. Love this interview! I’m beyond wildly impressed that you’re working on two books simultaneously. And I love this line: “My favorite part of being a writer is that I am a writer!” Awesome.